PA Works has dished out another interesting and visually appealing anime series, known as Nagi no Asukara. This series is another fantasy that focuses on an underwater world of mermaids being integrated into the normal world of humans on land. Now despite all of the characters looking very human, apparently the people of the land don’t approve of those from the sea, and vice versa. This whole theme of tension and discontent between the two races of human plays a big role in this first episode and probably will continue throughout the series. We eventually learn that the humans on the land originated from the sea and annually have an offering ceremony to appease the sea god that they sort of betrayed by favoring land. This detail will play a role later in the episode, but let’s move on to introduce the main cast from this episode. Our first protagonist is Hikari Sakishima (CV: Natsuki Hanae), a hot-headed, overprotective, and tsundere childhood friend of a young girl named Manaka Mukaido (CV: Kana Hanazawa). Manaka is a timid and little sister-like character to Hikari. The two other friends of the group are Chisaki Hiradaira (CV: Ai Kayano) and Kaname Isaki (CV: Ryota Ohsaka). Chisaki is the caring and mother-like figure of the quartet, while Kaname is the relaxed and friendly guy. These four middle school students are mermaids and have to attend a school on land after their original one was closed for some reason. Upon entering their new school, they meet a mysterious guy named Tsumugu Kihara (CV: Kaito Ishikawa), who catches Manaka’s interest immediately due to his unique presence. Together, these five are supposed to make up the main cast and are bound to play important roles throughout the series. Now as for the story, we begin with the four mermaid kids preparing to head onto land. Hikari is upset about Manaka not wearing her original undersea uniform with pride, and proceeds to bully her until she decides to go home and change. 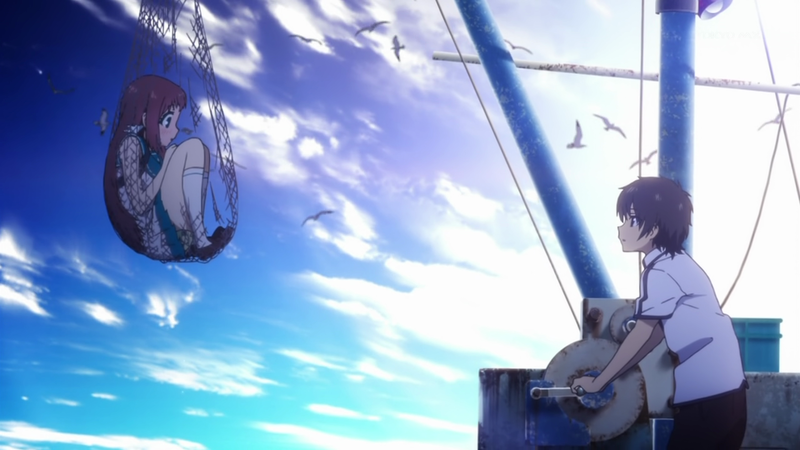 While Hikari and the other two friends head onto land, Manaka rushes out and gets caught in by a fishing boat. This is where Manaka is pulled and meets Tsumugu for the first time. 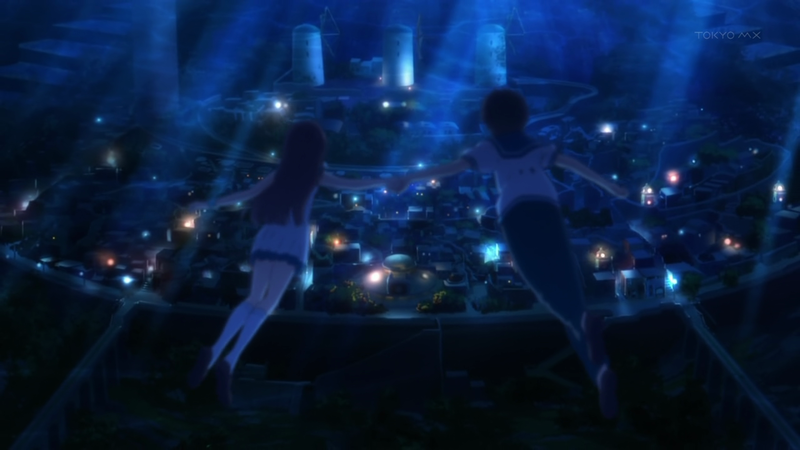 Hikari is freaked out by the sight, but realizes that Manaka is having what could be her first romantic encounter. After arriving at the school, the four have to introduce themselves, but do not receive a warm invitation from the class. While Chisaki and Kaname try to play it cool, Hikari acts obnoxiously in retaliation. The four then return to the sea after class ends, and Hikari heads off to meet with the Men’s Club. In the club, the mermen are discussing how the land-dwellers may not continue the offering ceremony mentioned before, which could stir up trouble with the sea god. They then request Hikari to talk to his father and Lord Uroko (CV: Kousuke Toriumi) about the situation. While heading to the shrine, Hikari runs into Manaka and both of them go off to meet the Lord. There, Lord Uroko refills Manaka’s fire and then proceeds to act very perversely towards her. 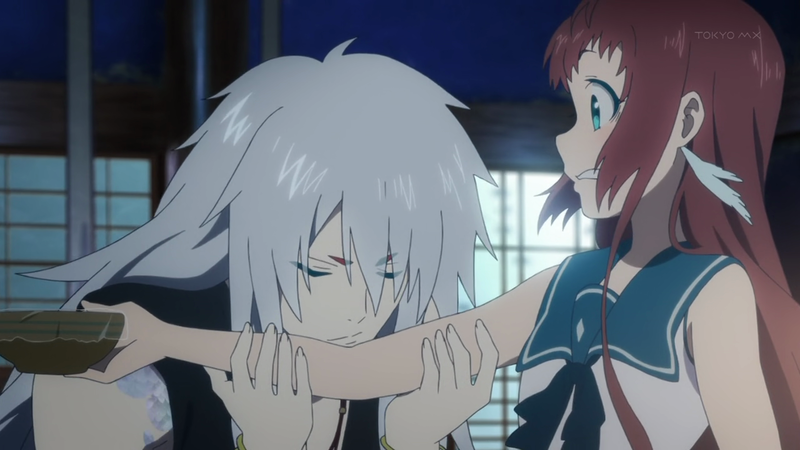 Manaka shoves some a bowl of food in his face and runs away after he threatens to curse her. Aquaman or the mermaid police should be contacted immediately. The next day, Manaka refuses to go to school due to actually being cursed by having a fish grow out of her knee. Hikari helps her cover up the fish and the gang head up to the surface for school. Later on in the day, Manaka becomes upset and runs into a forest, before falling and injuring herself. She finds herself unable to move, but is luckily saved by the mysterious Tsumugu. After healing Manaka with salt water, Tsumugu comments her on having such a lovely fish and compliments her for being beautiful as well. Meanwhile, the other three mermaids of the gang were searching for Manaka frantically before Hikari runs into her and Tsumugu in the evening. 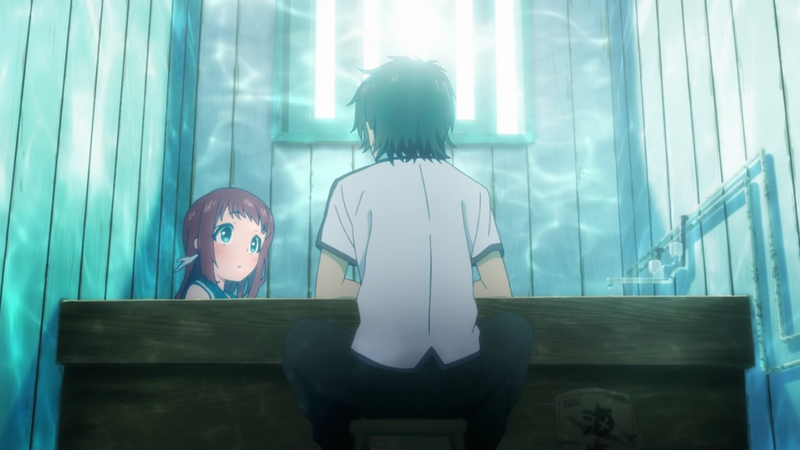 Hikari becomes overprotective again before Manaka agrees to return home with him and the episode ends. 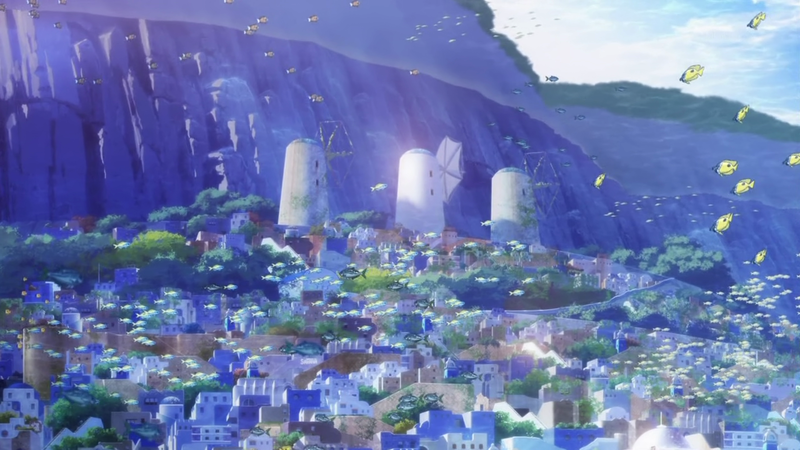 So this new anime series of PA Works is very impressive with the visuals and has an interesting story. When I first saw the trailer, I assumed that the series was about everyone living underwater in some way. I must say that it was quite surprising to find out that the series was about two races of humans and dealt with the conflict and prejudice between them. Along with this, we have a tale dealing with romance, drama, and trust amongst five young kids. While I did enjoy the visual presentation a lot, the story itself wasn’t as satisfying for me, due to the heavy presence of drama. I haven’t ever been a strong fan of drama, but I still think the story is interesting and the series has good potential overall. I’d personally prefer for the series to become more lighthearted once the four mermaids come to befriend the land-dweller, but that probably won’t happen until mid-way through the series. I would recommend this series to anyone who is a fan of romance/drama and want to enjoy great art-style and visuals as well.